Kid's most favourite vegetable is Bhindi/Bendakaya/Ladies Finger. I normally make only fry with it. When my neighboring aunt gave this stuffed bhindi all my family members liked it very much. So thought of give it a try, it came very well and tasty. She gave it with jowar roti but I liked it with rice only. The number of bhindi we use for this curry depends on the number of people consume it. We can increase or decrease the number. I made it for six people. We use small and tender bhindi for this curry. Dry roast peanuts and sesame seeds. In a blender jar add roasted peanuts, sesame seeds, red chilli powder, garam masala, salt and turmeric powder. Blend them and make a coarse powder. Slit ladies fingers. Do not cut them completely as we have to stuff the masala. Stuff the above masala into each ladies finger and keep them aside. Chop Onions. Heat oil in a kadai, add ginger garlic paste and fry it. Add chopped onions and fry them. Fry them till they turn translucent. Add the stuffed bhindi to it and stir well. Cover it for 5 minutes. Keep stirring till the bhindi cooked. Lastly add the left over masala to it and mix well. 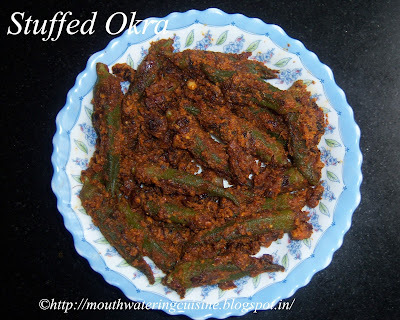 Serve stuffed okra curry with hot piping rice or with roti.